Just so you know, I’m totally obsessed with stripes. And polka dots. 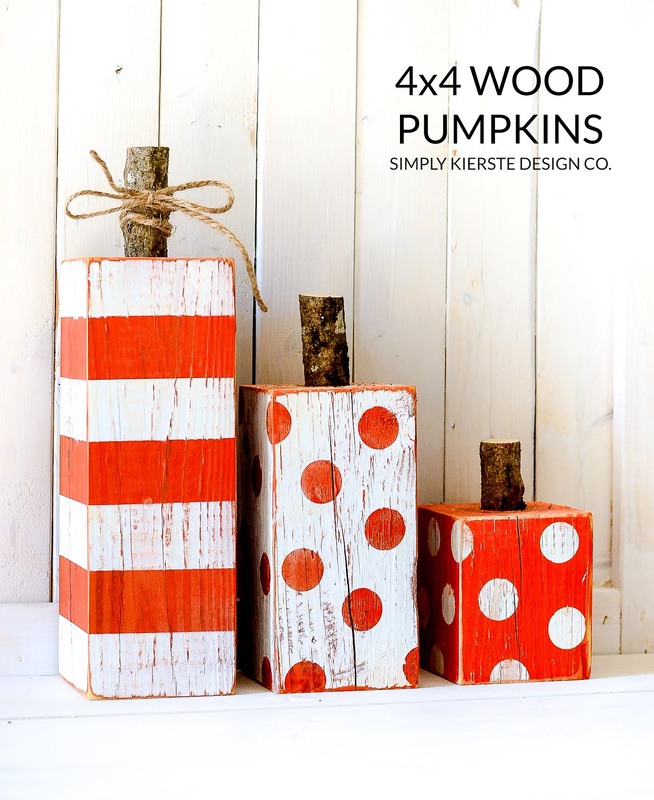 I’m giddy over these Striped & Polka Dot 4×4 Wood Pumpkins, and they are fall decor perfection! You are going to love how easy they are to make…and I’m going to show you how! These would be really fun to make in a group (Super Saturday), as a gift, or for your own cute house! I made these for less than $2, since I already had the paint. Going in on it with someone will drastically reduce your costs, because you can share paint, and the 4×4 post. You can get a lot of the supplies at Michaels–craft paint, twine, hot glue, vinyl, and even circle stickers if you don’t have a Silhouette. The rest of the stuff I got at Home Depot. 1. 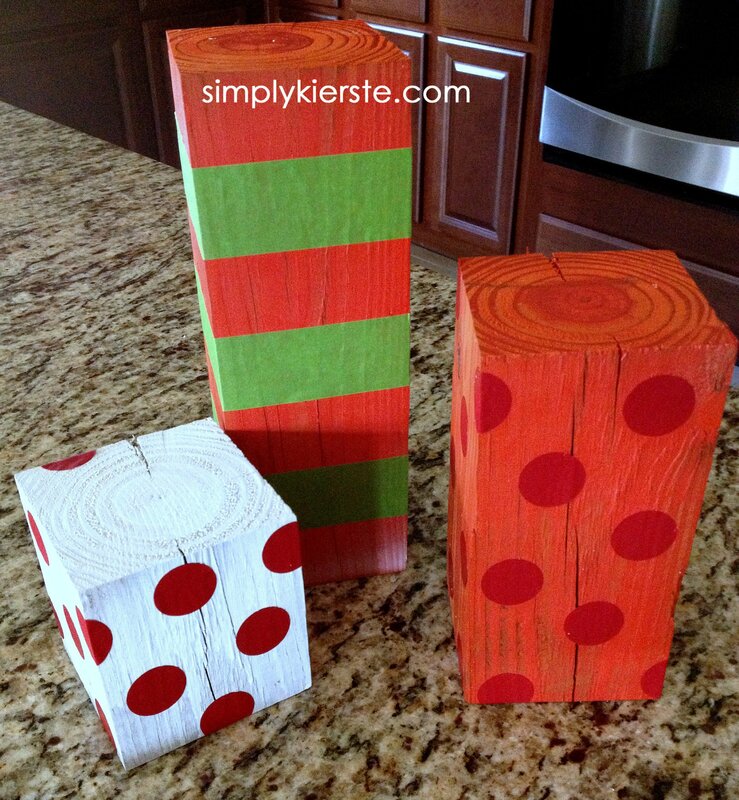 The first step is to paint your wood the base color–the color you want your polka dots to be. For the stripes, your base color will be the one that you DON’T want the top to be. Let it dry completely. 2. Apply your round stickers to the ( I used my Silhouette to cut out 1 inch circles) pieces of wood that you want to be polka dotted. I didn’t have a pattern that I followed–I just added them the way I liked them! Apply your painters tape to the piece of wood you want to be striped. I used Frog Tape, and applied it so that I skipped a space equal to the size of the tape, so that the striped would be even. 3. Once the tape and stickers are on, you can paint the wood the top color–the other color! For example, if you painted a piece of wood white first, then added the stickers, you would spray it orange. The wood would end up being orange, with white polka dots. Let dry completely. 4. Remove the stickers and tape. Using a 1 inch spade bit, drill a hole in the top of each piece of wood. 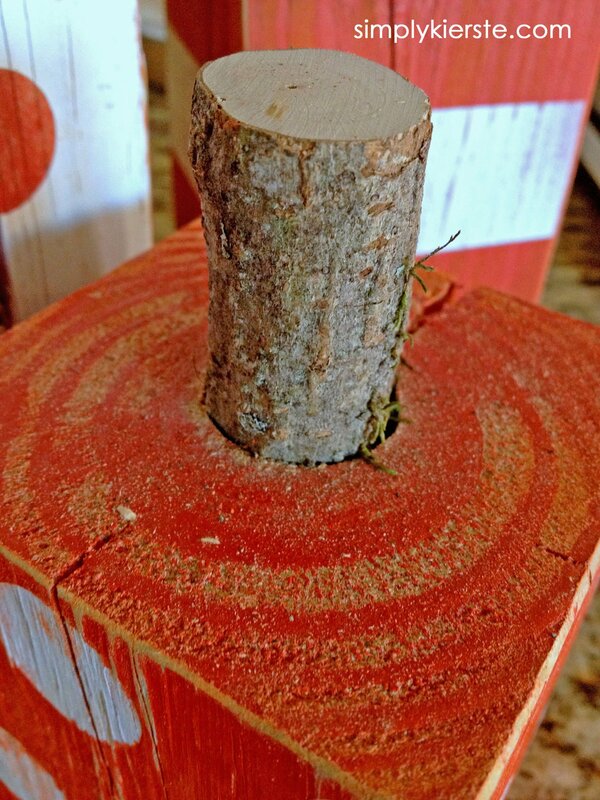 Cut your branch/stick down to the height that you want, then use hot glue or wood glue to secure it inside your drilled hole. If you use a branch that’s smaller or larger than 1 inch, you will have to use a different size spade bit. Try to find a branch that’s close to the size of one of your bits, or there will be a noticeable gap. 5. Sand the edges of your wood, and VERY lightly on the fronts. The paint will come off easily, so use a fine grit sandpaper and go very lightly. It’s so cute, because the color you painted first will come through, giving it a really great texture and dimension. Wipe of all the excess dust, and tie twine to the largest pumpkin! Ta-da!!! Darling striped & polka dot pumpkins!!! LOVE LOVE LOVE!!! These are the perfect fall decor, because they can stay out for fall, Halloween, and Thanksgiving! I love these. They look great. Totally loving the amazing cuteness of these pumpkins!!! Making, pinning, loving! Just made them. Went to Lowe’s and the man told me I had to wait 30 days for the wood to dry! What? I don’t have 30 days….Halloween is right around the corner. We’ll see what happens. Worse case….$2.00 down the drain!!! lol They are adorable!!!! Making them for all my friends! It must be treated wood. I’ve used it many times before, and never let it dry for 30 days beforehand. It does depend on how “wet” it is–if it’s super wet, then you may want to set it out in the sun for a few days first. Good luck!! OMG, these are so dang cute. I love them and want to make some.. I am in LOVE with these! I will make these this fall. Thank you!!! This is OH so cute!! Thankfully I have a husband who can do the cutting and drilling. I might just have to try this. These are so cute! I’ve found my next “Craft Night” project! these are so stinkin cute!!!!! LOVE! Thanks, Kierste! Oh my goodness! They are so so cute!! I want to make them right now:) Thanks for sharing!! Do you prime you wood before the spray paintI can’t get my spray paint to layer well. I don’t prime my wood on things like this. Make sure that the first coat is totally and completely dry. Also, use a really good spray paint. I prefer Rustoleum, and they actually have a paint and primer in one, that you could try. You just need a light coat for the bast coat–one that covers, but not really thick. Good luck!!! Thanks–just tried a nicer spray paint and it worked much better than my cheap stuff I use. Thanks for the tip! I think these will make a great front porch decoration. Should I put a sealant on to protect the paint? Thanks for sharing! In the picture, the tallest pumpkin looks like it is taller than 10″ especially if the stripes are 2″. Can you please verify heights again? The tallest one is 10 inches. I said the tape wasn’t quite 2 inches, but I didn’t put the specific measurement. I think I need to go change that! The tape was probably closer to 1.5 inches. I was hoping you could tell me what kind of wood did you use? I used old 4×4 posts we had, but you can use a new 4×4 post that can be bought at any home improvement store. I prefer untreated posts, if you can find them, but if you can’t, the treated ones will work too. I am having a horrible time finding any orange paint that isn’t a gloss… I’m assuming you didn’t use a gloss? Mine was a gloss (had the same problem, but didn’t want to use craft paint), but I distressed it with my sander, which eliminated the glossy look. Even a light sand will help!!! I’m so glad!!! Thanks so much for letting me know! :) I love to hear about it! I like your pumpkins so much! I think that I will try to make some too! Until now I only did some of fabric. What finish of paint did you use? Gloss, satin, etc? I used Rustoleum spray paint, in orange. It was gloss, which is the only thing I could find in that color. I always sand the paint to distress it, which removes any gloss that might be there. These pumpkins are ABSOLUTELY gorgeous! I love them! Oh my goodness, Lindy, thank you so much!!! Glad you stopped by!!! I just love your site and have been following you for awhile now. 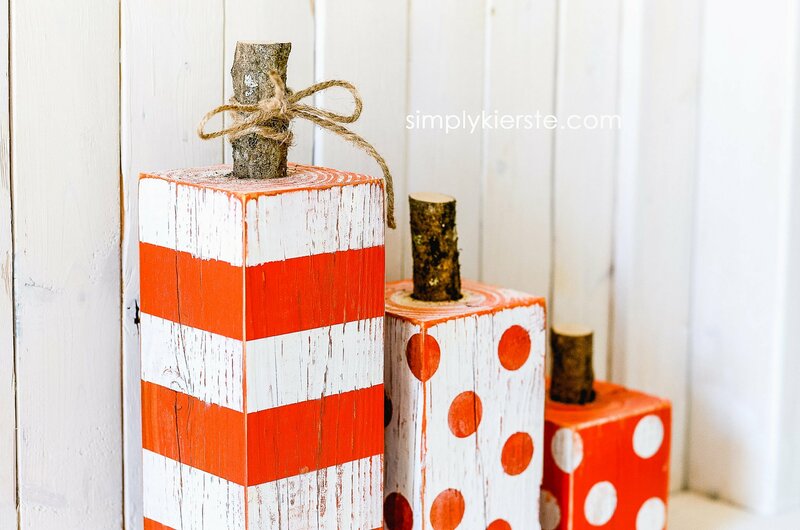 These stripped and polka dot pumpkins are great. I had to feature them on my Facebook page this morning. Your crafts and pictures really inspire me!! I can’t find where you added this craft on your Facebook page. These pumpkins are adorable and so simple to make. I am hosting a craft day at my house for family and friends to make these. Thank you for sharing your talents with all of us. I look forward to more ideas on your blog. How darling! What finish did you use on the spray paint or does it matter? Sorry! I should have been more clear. What finish was the spray paint? Was it gloss or satin or flat or does it matter? Thanks! Adorable! Any suggestions other than vinyl circles. I bought round xmas stickers and it didn’t work! I repainted over but need another suggestion. Thank you! What went wrong? Did they not stick? You could buy a sheet of vinyl at Hobby Lobby, Michaels, or Joann Fabric, then use a 1 inch circle punch to cut circles out. I’ve bought single sheet of vinyl before, or if you’re going to do it with friends, you could buy a roll–doesn’t matter which brand, just buy with they have! Good luck, and let me know if you have any other questions! Thanks – it worked! I love them! Is vinyl sheets sticky? Just wondering how they stick to the wood? Yes, vinyl sheets are sticky. Once you punch the holes out, peel off the back, and stick them onto the wood! Oh I am giddy. I love them! I’ve made the firecrackers. But these are great! Thanks for including the ‘how to’ I’d love you to link to my Fabulous Fall linky party!! Using this same concept…any ideas for Christmas? What kind of spray paint did you use? Was it gloss, satin, or flat. Yes, you could use craft paint, but it will take a lot—it’s absorbed into the wood easily. It also takes a little longer to dry. If you plan for these possibilities, you should be fine! You can also spray paint outside–lay a tarp out on your driveway or porch, and turn on the outdoor lights–if you have space. Thank you so much, Deborah!!! So glad you stopped by! These are absolutely adorable. I am working on a set of these right now. Would acrylic craft paint work ok, ya think? Spray painting is such a mess. Any tips you can give me? Thank you! Thank you so much! 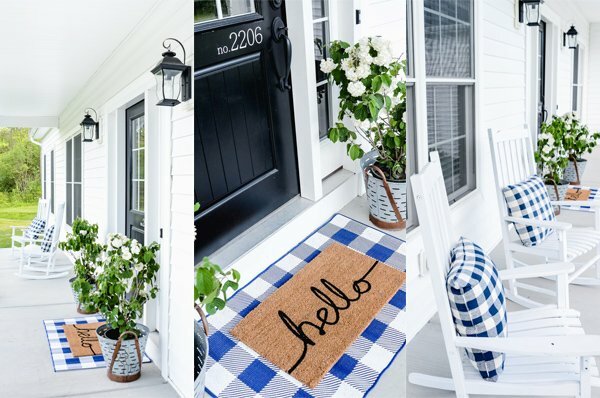 Yes, you can use craft paint. I don’t typically use it because it takes a lot more paint, and several coats, meaning more time. The wood soaks up the paint faster. But, it will totally work, and if you prefer it, you can definitely use it! When I spray paint, I lay out a tarp for protection. I have squares of plywood with nails poking out of it for my wood to sit on so it’s off of the ground, and I do a quick spray. If you’re in a confined space, or don’t have room to use spray paint, or don’t like the mess, then craft paint is a good option! Just buy more paint than you think you’re going to need, and you can always return it unopened if you don’t need it. Added this to my Pinterest board for fall crafts I wanna do and included you on my blog for the November Blogathon for links to awesome fall crafts! LOVE! LOVE! LOVE!!!!! Yay, thank you so much, April! So glad you love it! I am making this project and now that I’ve read through the mile of posts see that there were things you added or adjusted to the directions…would be helpful if you change he directions so that’s what we would have to go by. Thanks for posting, it is adorable. Too cute! How many blocks of wood do you think one can would cover? I am SO sorry, Becky! I don’t know how I missed this comment! I’m sure it’s way too late, but it really depends on heavy you are on the paint. I can usually get 3 sets at least out of a white can and orange can–maybe even 4 or 5. Love these adorable pumpkins! Thanks for your cute post! We are thinking of doing these for a Super Saturday activity and we were wondering how long from start to finish they took to complete? Thanks again!